The client is a global diagnostics company that wanted to enter the Indian market. It boasts a range of capabilities from the most rudimentary blood sugar tests to more advanced proteomics tests. Its key edge is that it can make home visits and perform tests from the comfort of patients’ living rooms and email/courier the results, saving patients’ time and money. Riding on its wave of successful acquisitions in Dubai and South Africa, it decided to expand its presence in other geographies, most notably India. After extensive due diligence, we decided that the best way to gain a foothold was by initially acquiring a local diagnostics company in a few metros such as Chennai, Hyderabad, Ahemadabad and Bangalore. Its global footprint notwithstanding, the client was a bit apprehensive about breaking into the Indian market exclusively under its own banner. It decided to create synergy between its worldwide reputation and the diagnostics capability of its respective local partner in each of the four metros. The web and mobile capabilities must reflect this approach with no compromise in the service levels and quality of diagnostics and reports. The global diagnostics company operate under both its own banner and that of the respective regional partner in each of the four states. 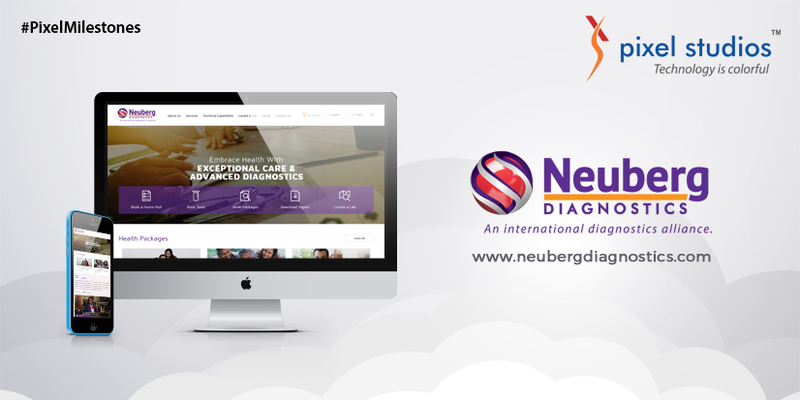 The website and mobile platforms both incorporate this philosophy thus gaining instant leverage in the Indian diagnostics ecosystem. Its core capability such as personalized service via home visits for screening and report delivery be the central theme of both web and mobile platforms. Customers are able to more easily identify with the global partner and feel confident enough through this combined branding approach. The new company is not only able to sustain but also to grow traffic and enquiries. The new website comprehensively packs the core capabilities of the combined entity. The CTA feature “Locate a Lab” couldn’t be more user friendly and robust.